I read this book when I was a kid because my brother read it and enjoyed it. 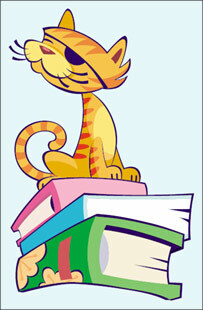 That may not sound like a big deal, but my brother had dyslexia and did very little pleasure reading. His third-grade teacher recommended it to him, and I remember him reading and talking about it - he loved it. So of course I had to see what it was all about. E.L. Konigsburg became one of my favorite authors from that point, and to this day I am delighted whenever she publishes a new book (I have her latest one on my book pile right now and am looking forward to it with great anticipation). Twelve-year-old Claudia is feeling unappreciated. She is a stellar student, does her chores, takes care of her younger siblings, but somehow she feels unimportant to the rest of her family. She hatches a scheme to run away from home - she won't be taken for granted after that, she's certain. She is a planner, though. She isn't just running away; she's running to. 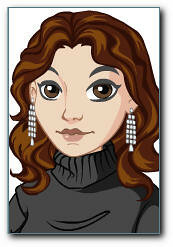 While Claudia is a meticulous planner, she is not much of a saver. That's where her little brother Jamie comes in. He never spends any of his money, and he also knows how to keep his mouth shut. Even so, Claudia doesn't confide in him until just before she's ready to leave. He doesn't have any gripes that make him want to leave home, but he is flattered by Claudia's trust in him and excited by the prospect of an adventure. With Claudia's planning skills and Jamie's financial expertise (and bag of cash), they make a good team - most of the time. They don't always see eye to eye, but what siblings do? They catch the train to New York City, and Claudia leads Jamie to their new home away from home: the Metropolitan Museum of Art. They blend in with the children from school groups during the day; at night they hide in the bathrooms till the museum is closed, and once they learn the routines of the night guards, they are free to roam the museum as they please. Soon they become caught up in the mystery of a lovely statue that has recently been sold to the museum, which some experts believe to be an early work of Michelangelo. The children become fascinated by the statue and, as they learn more about it, become determined to discover the truth about it - after all, they are in a unique position to look for clues. Claudia is especially touched by the statue, and it becomes increasingly important for her to discover the truth about it before she can go home. Jamie doesn't really understand, because he is younger and is basically along for the ride, but Claudia wants to go home a different person - she wants her adventure to have changed her in a fundamental way. And somehow, she knows, the statue of the angel has the power to do just that. But how can she hope to discover the truth when the world's foremost art experts are stymied? While the book is now a bit dated (most kids would have no idea what an automat is, for example), it is still a gripping read. I read this out loud to my 7- and 9-year-old children, and they both enjoyed it (and they never actually asked about the automat - they figured out it was some sort of restaurant). Living in a museum, being able to experience things that regular museum visitors cannot (like sleeping in priceless antique beds once slept in by kings and queens) is a wonderful fantasy to explore. I don't think I ever visit an art museum without thinking about Jamie and Claudia's adventure (and envying them) - especially when I walk past an indoor fountain - and when I visit the Met, I expect to see them tagging along with a school tour group, trying to fit in. 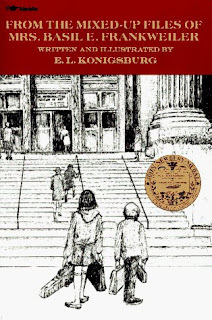 I have very much enjoyed all of E.L. Konigsburg's novels, but this one is one of my favorite books from my childhood. It was especially rewarding to read it to my children and share in their enjoyment of it, too. Brings back memories! My grade 6 teacher used to play books on tape (well, it was a reel to reel tape machine. Yikes!) and I remember listening to this one in class. Probably my favourite of hers as well. I LOVED this book and read it several times when I was a kid. One of these days I need to read it again. I remember reading this for the first time when I was in 7th grade - I guess it was 33 years ago. My children have enjoyed it, too, and recently we listened to the audio version. Great review! suzigoregon - I bet you'll enjoy it just as much when you do reread it. I know I did! Laura - Thank you! It's fun to hear that it's a second-generational read in your house, too, and that you have all enjoyed it! I've only read one book bu Konigsburg. (gasp) Luckily I have this one on the shelf and have listed it for a couple of challenges. Your review has made it even more enticing. Thanks! This sounds like such a fun story! I'm sure I would have loved it as a child, and I think I'd still enjoy it now. Framed - You are in for a treat. I'll be looking forward to hearing what you think when you read it! Nymeth - it really is a fun story. I think you'll enjoy it!